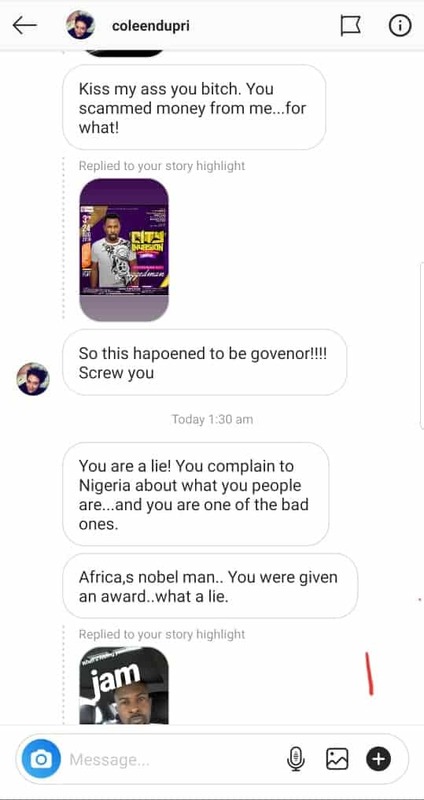 An Instagram DM chat between Nigerian singer, Ruggedman and an instagram user has gone viral, with the latter calling out Ruggedman for scamming her. The Instagram user, identified as Coleendupri, threatened to report Ruggedman to the United States Federal Bureau of Investigation (FBI) over claims of scam. “I really don’t know what she’s about though, its possible people using my photos and fake accounts on the internet may have scammed her but I’m sure I’ve put out several warning about that in the past. She’s free to report to whichever authority she pleases maybe we’ll understand it better”. See screenshots of the chats below.